I started coaching baseball to introduce my boys to the greatness that is America’s pastime and to be able to connect to them through something that we could participate in together. Little did I know how much other good could come from it. Through baseball we’ve been able to minister to others, form new/lasting relationships, test our own faith, learn (more) patience, hone our parenting skills, learn to communicate better, and to navigate the murky waters of organizational politics; I’m sure there’s plenty more. I’ve also had the ability to connect with a bunch of boys who at 4-8 years old may or may not be sure about themselves, their abilities, their desire for playing a team sport, or even have much confidence in general. We’ve won titles and had seasons where we came in somewhere close to last place and yet every season we walk off with our heads held high and smiles on our faces. I’ve coached with some great guys – guys who I’d go to battle for every day. I’ve coached with some crazies as well; they’ve all taught me something. Many times you don’t realize what you’ve learned until you take a moment to step away and examine; while I’m not ready to step away from baseball yet, our situation will probably change a little going forward. This fall will most likely be the first time our baseball family we call the Grapevine Horn Frogs will not field a team in something like 6 or 7 seasons. Most of us already new it but I hadn’t really taken the time to process it properly yet. It’s very bittersweet. My goal has always been to teach respect, good character, and integrity to some young folks (and sometimes their parents) through the game of baseball. Little did I know what all I might learn from them. This weekend I was rewarded with a gift much more fulfilling than a gift card or a night out on the town. My Frog family got together without my knowledge and put together a small token of their appreciation for me, they did a great job. Feel free to take 5 minutes and enjoy a few of the knuckleheads I’ve had the pleasure of being around the last 4 years. *For those tl;dr folks, there’s some pictures down below. If you’ve ever had the pleasure of being in my house, you know that we’re a little cozy and limited on space. Most days I like it that way, helps me to keep my material possession desires in check. We’ve had the boys in the same room for a while now but were just working off of two Ikea Malm twin beds in different corners of the room. It was functional but not necessarily practical. Discussions of bunk beds were had on several occasions but neither myself or my wife could come to agreement on what those would actually be. I’m not actually sure what the final straw was that made me really decide to make a change but sometime a month and a half or so ago, I finally decided it was time. Instead of going the standard Rooms-to-Go/Ikea/pressed laminate or particle board route, I wanted to do something a little more custom for them and after a bit of just Google-ing ideas, I felt like I found the right solution. Once again, discussions were had due to past examples of my “handi-work,” but I finally won over the person in charge of the house and she agreed to let me move forward. It was a random Sunday evening when I sent my business partner Ryan a text message to let him know we were closing up shop on the following Monday; once he found out why, it didn’t take much to convince him. He was at the house around 8 or 9 that next morning and we quickly loaded up for the closest big box hardware store here in town. 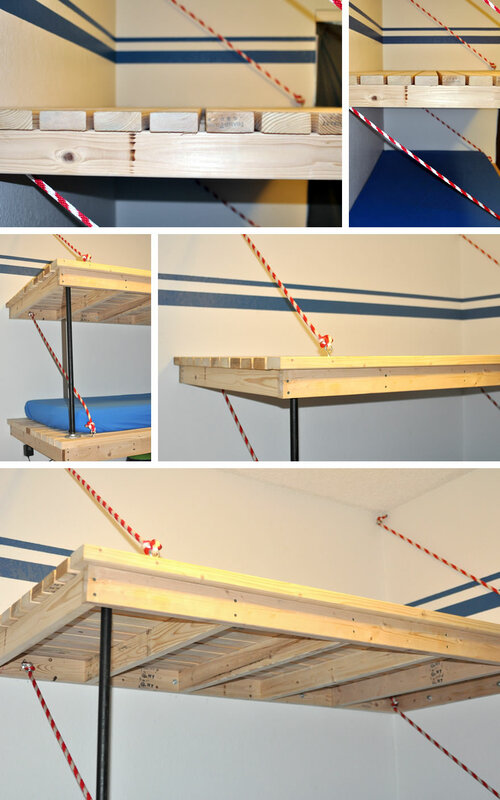 We spent an entire day (with multiple Lowe’s trips), 30 some-odd pieces of standard 2″ x 4″ x 8′, lots of screws/bolts/anchors, and about 50′ of nylon rope to end up hanging two custom, twin-sized beds from the wall in our boys’ room. They’re quite heavy, more than I anticipated. They’re each anchored 5 or 6 times into wall studs and the ropes are anchored as well. My wife was pleasantly surprised when she got home to see that we both accomplished the task and they turned out decently as well. She still had concerns about them purely hanging so I added the steel pipe, corner stands under the free-hanging corner to ease her (and my) concerns. In addition, I created some birch wood rails that slide under the edge of each mattress so they don’t come tumbling down in the middle of the night. The color of the birch matches the color of the 2 x 4’s pretty well. Finally, I created a solid, yet removable ladder to get up and down from the top bunk. It’s made out of some of the leftover 2 x 4’s from the project and is a nice replacement to the metal folding ladder I offered them for the first few days. The boys love them and have been put on a scheduled rotation of who gets the top bunk, changing out each time we wash their sheets. It’s created more play space for them in their room and allowed us to free up the other bedroom in our house purely for guests and/or a nice open space for us to make the boys go play when they’re being a little too noisy! Since I don’t normally get to work with my hands, it was a nice change of pace. I was able to create something custom for my family, keep the cost well below what we might have paid for a nice set of bunk beds, and possibly even restored a little confidence in my wife that might allow me to try another project down the road. I’m sure there’s much more to say about the craftsmanship, the process, the tools, the legacy, etc but I’ll leave that for another day or possibly another writer. Here’s a few shots of the finished pieces. If you want more details about our process or the plans for the beds, hit me up. I’ve got a dollar for anyone who can prove they get through this without cracking a smile. And for the record, they get their moves from their momma. 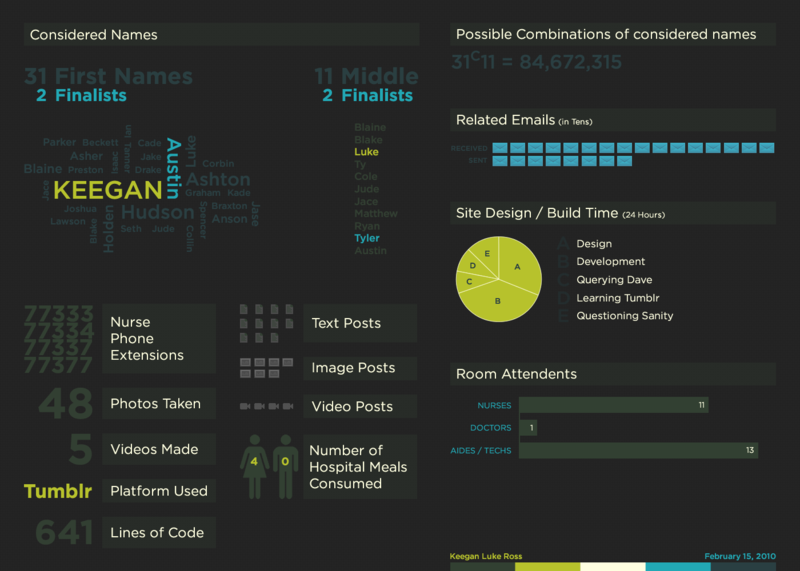 I kept a few stats Feltron-style leading up to and during our stay in the hospital with kid #2. Thought I’d share them with anyone else who wanted to see them. It hasn’t been done but could be turned into a poster if there was interest (from family, I am assuming).